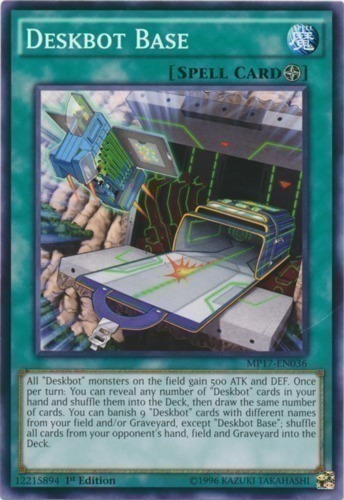 All "Deskbot" monsters on the field gain 500 ATK and DEF. Once per turn: You can reveal any number of "Deskbot" cards in your hand and shuffle them into the Deck, then draw the same number of cards. You can banish 9 "Deskbot" cards with different names from your field and/or Graveyard, except "Deskbot Base"; shuffle all cards from your opponent's hand, field and Graveyard into the Deck.